Dr. Lawrence Wittner (https://www.lawrenceswittner.com/) is Professor of History Emeritus at SUNY/Albany and the author of Confronting the Bomb(Stanford University Press). 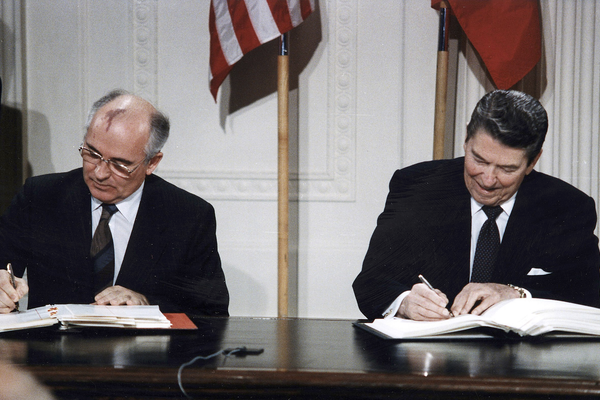 Gorbachev and Reagan sign the INF Treaty in 1987. At the beginning of February 2019, the two leading nuclear powers took an official step toward resumption of the nuclear arms race. On February 1, the U.S. government, charging Russian violations of the Intermediate-Range Nuclear Forces (INF) Treaty, announced that it would pull out of the agreement and develop new intermediate-range missiles banned by it. The following day, Russian President Vladimir Putin suspended his government’s observance of the treaty, claiming that this was done as a “symmetrical” response to the U.S. action and that Russia would develop nuclear weapons outlawed by the agreement. In this fashion, the 1987 Soviet-American INF Treaty―which had eliminated thousands of destabilizing nuclear weapons, set the course for future nuclear disarmament agreements between the two nuclear superpowers, and paved the way for an end to the Cold War―was formally dispensed with. Actually, the scrapping of the treaty should not have come as a surprise. After all, the rulers of nations, especially “the great powers,” are rarely interested in limiting their access to powerful weapons of war, including nuclear weapons. Indeed, they usually favor weapons buildups by their own nation and, thus, end up in immensely dangerous and expensive arms races with other nations. Russian leaders, too, though not as overtly provocative, have been impatient to build new nuclear weapons. As early as 2007, Putin complained to top-level U.S. officials that only Russia and the United States were covered by the INF Treaty; therefore, unless other nations were brought into the agreement, “it will be difficult for us to keep within the [treaty] framework.” The following year, Sergey Ivanov, the Russian defense minister, publicly bemoaned the INF agreement, observing that intermediate-range nuclear weapons “would be quite useful for us” against China. By 2014, according to the U.S. government and arms control experts, Russia was pursuing a cruise missile program that violated the INF agreement, although Putin denied that the missile was banned by the treaty and claimed, instead, that the U.S. missile defense system was out of compliance. And so the offending missile program continued, as did Russian programs for blood-curdling types of nuclear weapons outside the treaty’s framework. In 2016, Putin criticized “the naïve former Russian leadership” for signing the INF Treaty in the first place. When the U.S. government pulled out of the treaty, Putin not only quickly proclaimed Russia’s withdrawal, but announced plans for building new nuclear weapons and said that Russia would no longer initiate nuclear arms control talks with the United States. The leaders of the seven other nuclear-armed nations have displayed much the same attitude. All have recently been upgrading their nuclear arsenals, with China, India, Pakistan, and North Korea developing nuclear weapons that would be banned by the INF Treaty. Efforts by the U.S. government, in 2008, to bring some of these nations into the treaty were rebuffed by their governments. In the context of the recent breakdown of the INF Treaty, China’s government (which, among them, possesses the largest number of such weapons) has praised the agreement for carrying forward the nuclear disarmament process and improving international relations, but has opposed making the treaty a multilateral one―a polite way of saying that nuclear disarmament should be confined to the Americans and the Russians. Characteristically, all the nuclear powers have rejected the 2017 UN treaty prohibiting nuclear weapons. But the history of the INF Treaty’s emergence provides a more heartening perspective. During the late 1970s and early 1980s, in response to the advent of government officials championing a nuclear weapons buildup and talking glibly of nuclear war, an immense surge of popular protest swept around the world. Antinuclear demonstrations of unprecedented size convulsed Western Europe, Asia, and North America. Even within Communist nations, protesters defied authorities and took to the streets. With opinion polls showing massive opposition to the deployment of new nuclear weapons and the waging of nuclear war, mainstream organizations and political parties sharply condemned the nuclear buildup and called for nuclear disarmament. Consequently, hawkish government officials began to reassess their priorities. In the fall of 1983, with some five million people busy protesting the U.S. plan to install intermediate-range nuclear weapons in Western Europe, Ronald Reagan told his secretary of state: “If things get hotter and hotter and arms control remains an issue, maybe I should . . . propose eliminating all nuclear weapons.” Previously, to dampen antinuclear protest, Reagan and other NATO hawks had proposed the “zero option”―scrapping plans for U.S. missile deployment in Western Europe for Soviet withdrawal of INF missiles from Eastern Europe. But Russian leaders scorned this public relations gesture until Mikhail Gorbachev, riding the wave of popular protest, decided to call Reagan’s bluff. As a result, recalled a top administration official, “we had to take yes for an answer.” In 1987, amid great popular celebration, Reagan and Gorbachev signed the INF Treaty. Although the rulers of nuclear-armed nations are usually eager to foster nuclear buildups, substantial public pressure can secure their acceptance of nuclear disarmament.